There are very few energy bars that taste better than the Onebar and those that do generally have way more refined sugar. Baobab fruit, pear and chicory root form the base of every bar and compliment the various flavors offered. Smaller in size than your average energy bar, each is only 0.9 oz. but boasts a full serving of fruit per. While not protein laden these snacks are perfect for a quick boost you need to push through to the summit. It was a struggle to stop eating long enough to take this picture. 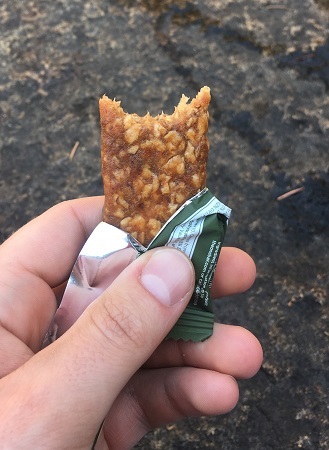 Onebar’s are delicious and a great size for a quick boost of energy. This entry was posted in Activities, Activities, Alpine Mountineering, Activities, Backpacking, Brands, Activities, Car Camping, Activities, Fishing, Gear, Food, Gear, Activities, Hiking, Brands, Onebar, Product Review, Activities, Resort Skiing, Activities, Sea Kayaking, Activities, Ski Mountaineering, Activities, White Water Rafting.